Address: 81 King George st. The rasta sign and boombastic reggae music in this place are hard to miss at the noisy King George st, and also because of the line of people that are waiting, especially on Fridays. The hummus here is tasty and you will want some more all the time (see detail below). 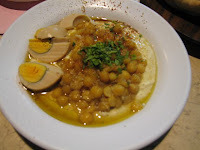 Unfortunately not everything is equally tasteful, for example their masabcha is quite bitter and too thick compared to other hummus places, so the plain hummus plate is the recommended dish. The fries are quite greasy and soft, maybe not like how everybody likes it. They also have nice falafel and a simple vegetable salad. 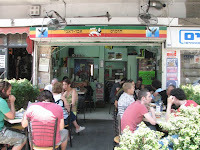 It's on King George 1 minute walk from Dizengoff center. Next to the intersection with Bar Giyora st.
* Detail: you can have seconds and thirds of hummus at Abu Dabi for free, it's part of their service. Also the sweetened black coffee after your meal is on the house.